Way back in late 2002, SolidWorks users received what I call a “game changing” enhancement in SolidWorks 2003. This was the version of SolidWorks that first introduced the ability to model multiple solid bodies in a SolidWorks part file. Looking back now, it is sometimes hard to imagine SolidWorks without it. The way SolidWorks handles multiple solid bodies today is still in my opinon the BEST solution offered in any MCAD package on the market. SolidWorks 2010 introduces a key enhancement to multi-body parts by allowing users to assign SolidWorks Materials to each body independently. The interface is pretty straight forward. 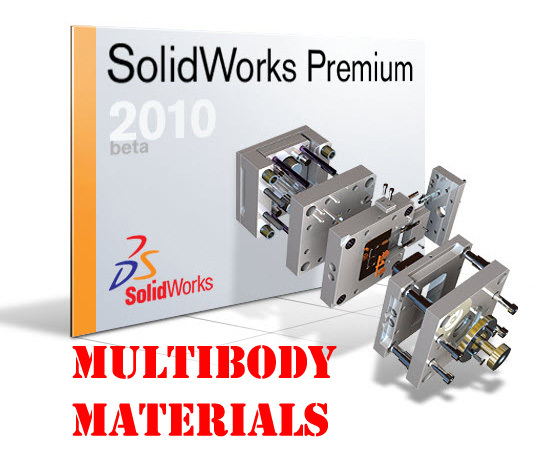 To assign a material to a solid body, you right mouse button select the desired body inside the Solid Bodies folder in the FeatureManager Design Tree. The process is identical to assigning a Material to an entire part. Material assignments to a solid body override the Material assigned to the entire part. Below is a short video that shows how to assign Materials to a Multi-Body file. 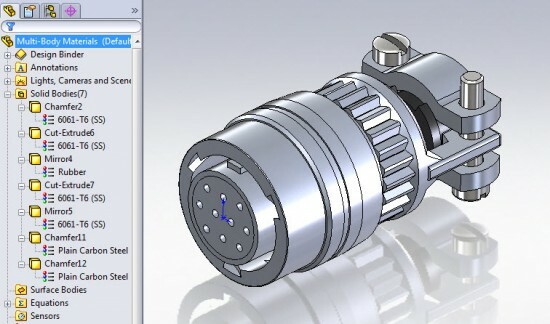 Stay tuned….more SolidWorks 2010 enhancements to come! This sounds like a great solution for overmolded parts. We do a lot of them here, but the tradition is to make two separate parts and have an assembly. I have only been here for about 2 years, and this method has always bothered me somewhat. I would really prefer to use some sort of “top down” method for these parts. It would seem that the multi body thing is the easiest answer. But how do you control revision levels with a multibody part? When one body needs to change revision level, but the other does not? We are not using a 2 shot mold, we use separate tools for premold and overmold and they consistently have different revision levels. We also do overmolded parts and sometimes do them as separate parts and sometimes as multibody parts. We keep track of the revisions in the drawings and the multibody parts just have to live with the part revision being different from the drawing revision on at least one of the bodies. I'm afraid I don't have a better approach. As Jerry as suggested below, you could have separate revisions for each body by having a Drawing for each with it's own revision. The “master” part file is then treated as purely a design file which in actuality is exactly what it is. If you are using a PDM system such as SolidWorks Workgroup PDM or SolidWorks Enterprise PDM, you can easily keep track of which revision of the design file (part file) was used to create any particular revision drawing file. SolidWorks 2010 contains some enhancements to creating drawing views of Multibody parts. It is on my list of things to review for the site, so stay tuned. Haven't heard from you in a while. I hope you are doing well. Excellent suggestion. I agree with you, it might not be our desired approach…but it does work. Multibody parts is the ONLY instance in our system where the part/assembly revision doesn't match the Drawing revision. I have found that it is much easier to track instances like this if you have a PDM system in place. We currently aren't using a PDM system, but I am trying to get one in house. We are just getting big enough that confusion of part revision and location can be an issue at times. We generally do not create drawings for the overmold, so it would be hard to control the revision level there. We have lots of components that we never create drawings for. The drawings we do create have only the most important dimensions on them. Very interesting, I really like that interface. Thanks for sharing the screenshots. These material proves to be damn good. I am looking forward to read your next freat article… Nice article, thanks. Your right. Your output are great. It is so helpful and informative. Want to know if the hotel for your next trip is any good? Check out the rants and raves on Raveable Hotel Reviews. Raveable indexes millions of user reviews from all over the web to surface the facts about every hotel in the US. Finding the most romantic hotels in Las Vegas, a kid friendly hotel in Myrtle Beach or the best hotel in Miami with in room Jacuzzi cannot get easier with Raveable powerful search engine. In addition, Raveable classifies hotels with hard to find amenities like hotels with fireplace, hotels in in room jacuzzi, and hotels with indoor pools. Nice post.This post excellent topic in Solid Works . Are this animation can be put in a website because this are great and I'm sure they are effective to make the site more beautiful. this is a really good site and more information! This sounds like a great solution. Thanks Ricky and Jerry. Great blog. This sounds really great. I want to try it. Thanks for such nice post. great design.thanks for the post.i like this site. great design.Great blog.This sounds like a great solution for overmolded parts. t is sometimes hard to imagine SolidWorks without it. The way SolidWorks handles multiple solid bodies today is still in my opinon the BEST solution offered in any MCAD package on the market. 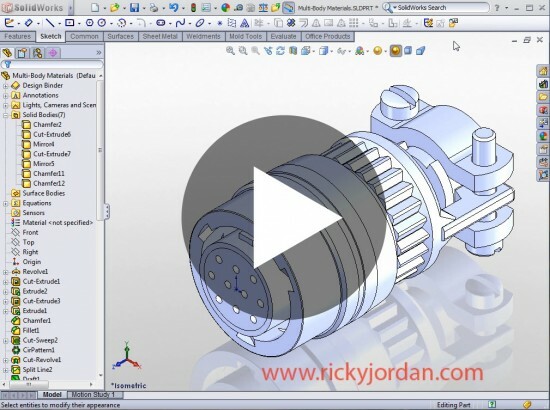 It is sometimes hard to imagine SolidWorks without it. The way SolidWorks handles multiple solid bodies today is still in my opinon the BEST solution offered in any MCAD package on the market. Wow! this is a great site. Thanks for the post. Thanks for information, good to know these things. You are not the average blog author, man. You surely have something powerful to contribute to the World Wide Web. Such a good blog. I will return for more. Hmmm….Are you right clicking in side the Solid Bodies Folder in the FeatureManager or the graphics area? I think that the website develop is fantastic and highly trouble-free for customers like me. I am quite often on the lookout for good blogs I am glad. This great article curiosity. Rattling excellent information are available on site .Good things. Awaiting reading more from you. Outstanding article over again! I am impatient for your next post. i love photography. i like your post very much. thanks. Great, I have already bookmarked your this page…Now I don’t have plenty of time for read but by reading beginning part I must say…it was a positive start .. Would love to read further too…Thanks for great post!